Web Urbanist is a digital magazine that features photos and articles about art, architecture, design, technology, and travel. Within the major sections listed, there are subcategories. For example, the architecture section divides into branches such as residential, commercial, and institutional, which makes it easy to navigate the website and focus on the content that interests you. 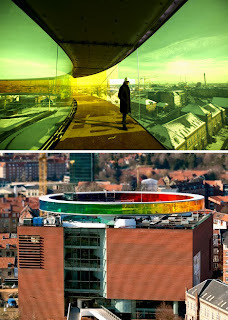 One of the articles that interested me was the Panoramic Rainbow: Circular Space Spans Color Spectrum by Olafur Eliasson. Olafur design a circular structure on top of a building in Denmark, with exterior walls of colored glass to offer a panoramic view. My first impression of the structure is that it appears to be floating on top of the building, which made me question what was carrying the weight of the floor and the roof. This made me appreciate the beauty in the structure's geometry and materiality, as simple as it is. I have never thought of using glass and circular shapes to obtain such effect. Another article that I found appealing is the Geometric Projection: Light Art Reshapes Nature by Javier Riera. 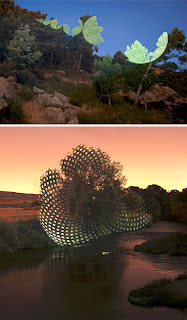 Using geometry and light, the artist demonstrates how there are mathematical patterns in nature. It is interesting to think that nature alone could be art. More importantly, his illustration of the relationship between nature, geometry, and light made me reflect on how beautiful design should demonstrate a strong connection to nature. Weburbanist.com offers creative ways of thinking about art, design, nature, and technology. Not only does it explore each topic individually but it also creates relationship between them. Whether you are interested in photography, art, or design, I suggest visiting this digital magazine. It may influence the way you think about design, or help you out with a specific project.